What I finally landed on was a nice dinner out at a place she’d told me about, but I’d never been. To keep the mystery going, I decided to add a second surprise for after dinner. Of course, since it’s a Mystery Date, she was curious. I kept the suspense up by only giving a few hints. One quick Tip to note though – To help her relax a bit and know how to dress for the occasion, an important hint you must give up early is what you’re going to wear. Other than that, I only gave her very vague hints. I told her it was a half an hour away, which could’ve landed us in quite a few fun locations and that I’d never been to this place before. I made reservations earlier that day on Open Table and we were all set. It turned out that even the drive to the restaurant was fun. She started narrowing her guesses based on the route I was taking. Of course, I played along and reminded her that there were still quite a few areas we could be going to based on the direction we were heading. When we finally arrived, she was delighted to discover that it was an Italian place on top of a downtown hotel that overlooked the city. A surprise for me was that it had a romantic outdoor sitting area that had soft white lights in the trees and outdoor fire pits. A quick note on budget. A night like this can be as expensive or inexpensive as you like. At a restaurant like that, even the appetizers and their least expensive meals are delectable delights! While we were waiting for our meal to arrive, I explained that I had two options planned for after dinner and asked her to pick a hand. I did it spontaneously, but in 20/20 hindsight, it would’ve been fun to have written down the two choices and put one in each hand to choose from. 1.) Go to the Casino that was at that same hotel as the restaurant. In case she picked that hand, I’d already put some gambling money in my wallet that morning when I made the dinner reservation. 2.) Go for drinks at another rooftop bar I knew she’d never been to that overlooked a different part of the city. She picked my right hand which represented Option #2. I told her it what it was and she was excited as it was a place she’d always wanted to go to. We had a perfect night and will definitely be putting a Mystery Date on our future Love Calendars! Feel free to utilize any of the Date Ideas on our website for your Mystery Date! 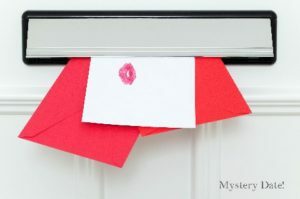 Another way to add a little more spontaneity into the night is to put your ideas in a Love Card and have her reach in and pick the Date for the night! Subscribe to our Blog today for other Love Calendar Prep Ideas and please follow us/like us on Pinterest, Facebook and soon on Instagram!